Commanders! We are just days away from the official launch of Transformers: Forged to Fight! We've come a long way since the Beta first launched, and the game has already evolved quite a bit, but we're just getting started! We'll be introducing a whole bunch of new content for you guys to play, including Legend of Kaon, an extremely difficult game mode that's suitable for only the best Commanders, and a brand new Alliance Missions map! We have also made a number of balance changes to Mods and Bots, based on data and observations we have completed during the Beta. We've also made a slew of changes to the levels at which different content and modes unlock, but this will not have any effect on most of our players that are already beyond those level locks. We want to thank all of you for taking part in our Player Beta. We could not have made this game as awesome as it is without all of you! Can you give us any clues to when the first Special Event may be? When 1.0 version will be deployed to app-stores? We do have a series of "Launch Party" missions planned during the first month of Launch. They're not fully fledged missions like the ones in Act 1 or 2 and are fairly simple, but do have some really great rewards for such short missions. We'll be working on longer missions for the future. It'll be coming on April 5th! Mike is the LOK like ROL in MCOC? Mixmaster is the only new addition to the roster on the 5th, then? if so, when can we expect more characters? So now will we start think that alpha spark become significantly easy to get. .as ROK will be permanent any special champs as reward like in rol. .Can you give any idea what will be the approx rating of ROK bots more then 30k or 40k. Is it possible to get 60 Alpha sparks from AM shattered lands crystal? Thanks for starting to post patch notes for us! Will AM be available at different times. For example, here in the UK it always starts at 1am and Im usually asleep. Its hard on my Battlegroup as they need me to take down some nodes in the beginning. Im just thinking that if you said ROK is harder then rol then what is the meant of releasing such hard quest in starting? ?as at that time almost all player did not get enough resources to rank 4 3*. Is there a plan to add shard as a reward when bots are duped? 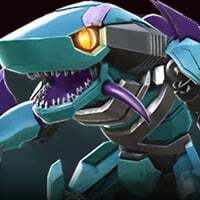 Mixmaster will be added directly to the Premium Bot Crystals on the 5th (you'll have to update to 1.0 to have a chance at him), and will join the rest of the roster instantly. We'll be continuing to add new Characters on a regular basis moving forward, but they'll be added to the Arena and have their own special crystals. They'll eventually be added to the regular crystals, but we're not going to say who those bots are just yet! They'll eventually be added to the regular crystals, but we're not going to say who those bots are just yet! Can I take a wild guess? Prowl, Starscream, Ultra Magnus, Grimlock, Megatron, Waspinator and Soundwave. On the 1.0 patch notes it says "Mission crystals have been replaced with direct ORE-13 payouts" can we get more info on this? And what if you was saving up T1&2 mission crystals, after update what happens to those? Will they turn to ore or will you be able to still open them at will. If so can this be answered before launch so we can decide to open them before the update or continue to save them. Where are the boss challenges? The graphics are horrible compared to most phones why??????? What device are you using? For some devices, we make the decision to turn down some graphical elements to ensure that the rest of the gameplay is running smoothly, but this is usually for lower end or older devices. Why Change Bludgeon? Decreased armor buff and no sig ability makes him kind of unplayable with little to no utility. The game also crashes on my phone HTC One M7 (Verizon) running Lineage OS 14.1 (Nougat) when it goes to enter the actual fight mode. 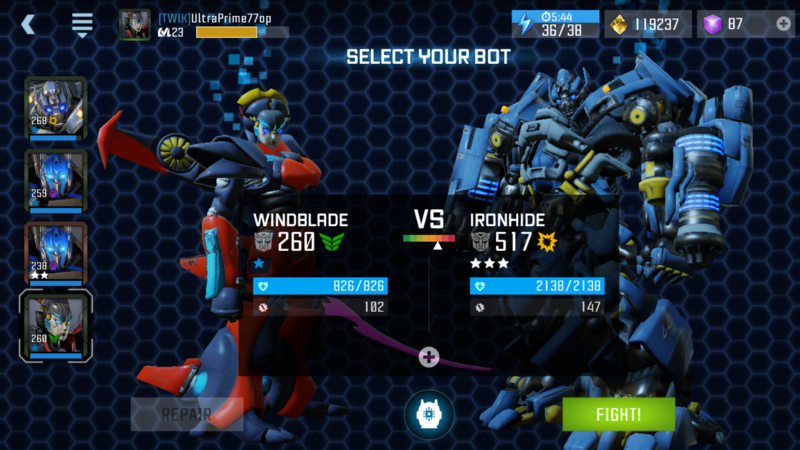 Everything appears to work fine (and not too laggy) until it tries to switch from the pre-fight loading screen to the actual fight screen. Then it just crashes to the Android launcher. Will the new forgotten ruins map be required to play by all alliances during next alliance mission? Or will we be able to select between it and shattered lands?